Many people contribute generously to charitable promotions, especially to those broadcast on Television and Radio, but know not where their money goes or how it is spent. Who benefits and did it really go where you would have really liked? 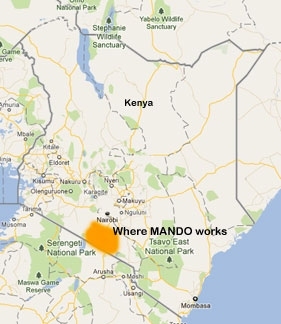 By contributing to self help initiatives such as MANDO you know exactly where your money is being spent and who is benefiting from it. Click here, or on the MANDO button below, to find out more and see how you can help. You can contribute physically by going to Kenya and living and working amongst these amazing people in a wonderful and different landscape or by donations. MANDO is in discussion to undertake some projects between June and December, 2014. Initial estimates for these projects are $15,000 to $20,000 for MANDO activities including costs for travel to sites, lodging and food. This is based on a $15 per hour rate. Participate with solar micro-grids in initial education and outreach to participating Maasai communities. Up to 6 communities under the direction of the project partners. Carrying out Evaluations in participating communities under direction of project partner. Carrying out post installation ongoing outreach and education in Maasai communities. Up to 6 communities (or all of them?) under direction of project partners. This includes outreach efforts with Suntec or other provider for home solar systems to households outside scope of micro grid project and also outreach to improved cookstoves with identified cookstove partners. Assisting project partners in community investment activities. Identifying potential community investments for approval by donors in up to 6 communities and working with communities or individuals to receive such investments. Assisting with business plan development etcetera. Costs for travel, lodging and food for these activities up to $2000. Water access projects such as bore wells and solar water pumps, community power options (e.g street lights, school electricity and health centre electricity). Costs per project and number of projects will depend in part on availability of grants and/or low interest loans to match any potential donors. You can contribute to this initiative and help the people in this region by contacting MANDO. You can contribute physically by going to Kenya and living and working amongst these amazing people in a wonderful and different landscape or by donations. In donating to projects such as this you know exactly where your money is being spent and who is benefiting from it. The nomadic pastoral Maasai people face such a severe drought that they are forced to become more agriculturally based, which is a huge change in their lifestyle. This means reliable water sources must be close to evolving communities. Click here, or on the MANDO button below, to find out more and see how you can help.